Hey Guys; Gordo Bond here. 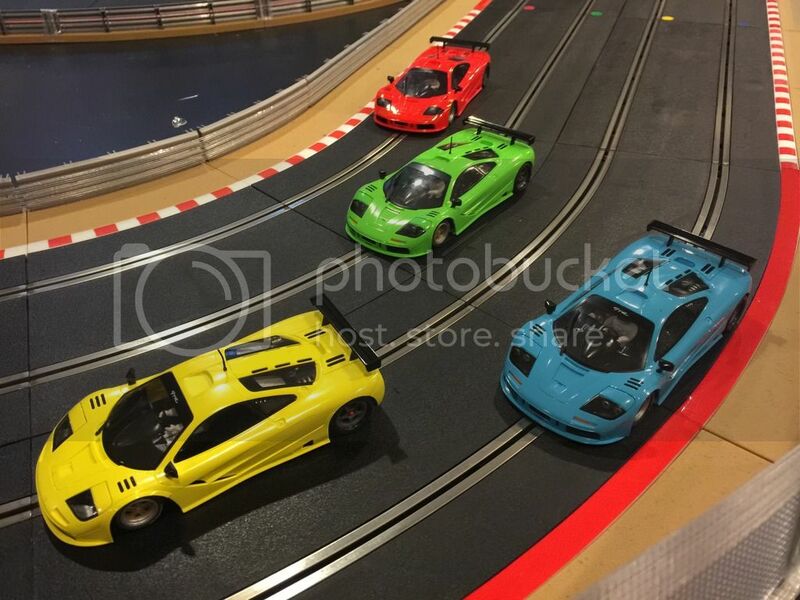 So I got my Mr. Slotcar - Mclaren F1 yesterday! Sweet car! So when you get your car you are going to notice that the front wheels rub inside the the wheel wells, and not just a little bit, but to the point that my front tires wouldn't turn. Before you go reaching for your dremel tool (guilty ) I discovered that there are some easier ways of dealing with this issue. #2. Using a 0.035" (0.9mm) allen key, remove the front wheels. When you do this turn the chassis over and 2 little black pins will fall out. #3. Take those pins that were located in the holes below the front axle, and holding the chassis upside down, insert these pins into the holes provided above the axle. #4. Reinstall the front axle with the chassis still in the upside down position, then flip it over and put the wheels back on. I wanted my front wheels to be flush with the outside of the the front wheel arches, so I installed some spacers on either side of the front axle to keep the wheels in perfect alignment. If you like the wheels tucked inside the body you can simply put the wheels back on without the spacers. Before I discovered what these little black pins do , I took some .9 mm Grub Screws and I screwed them into 2 of the 4 holes located above the front axle and it worked perfectly. This method allow me to secure the front axle in its lowest position. #5. Now you need to take little spacer about 1mm thick with a hole in the middle, and insert it between the front body mounting post and the chassis. Don't worry it doesn't make the car look too high, and the chassis will still sit pretty much flush with the bottom of the body. Now test fit with the body on to make sure that the wheels will turn freely in the wheel wells. Once you get it just right you can glue this spacer to the front body post so the it doesn't fall out and get lost the next time you open the car up. #6. Reinstall the body and off you go! Whole thing takes about 10 minutes, so before someone goes off on a rant here, just slow down take a breath and tweak it a little bit and everything will be just fine. 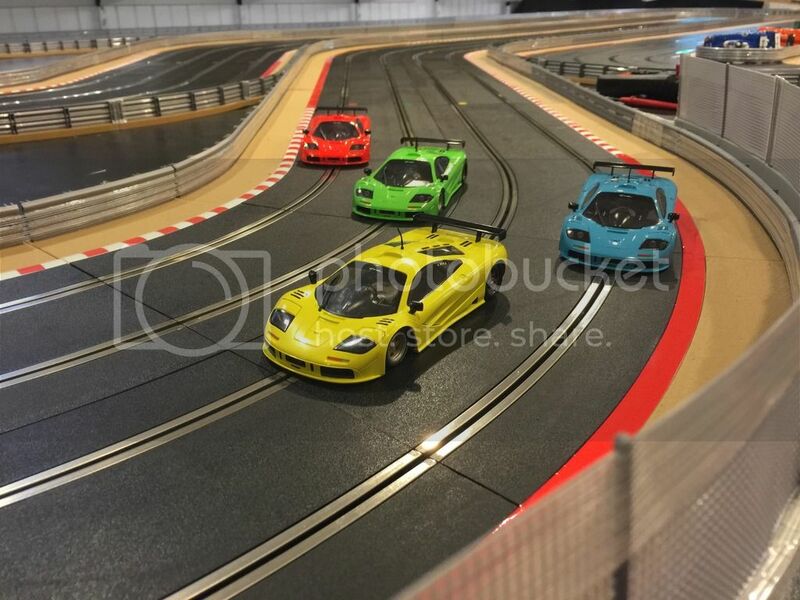 If I had a suggestion for Mr Slotcar it would be that they should include a few different thickness spacers and a .9 mm allen key with tier cars, or at least make them available if folks need them. Note: I am not affiliated with Mr Slorcar in anyway, these are just my suggestions on how to remedy this problem. Who knows maybe Ernie will join in on this discussion and he will have a completly different solution. In which case what Ernie says goes!! Ernie if I am talking out my %$# on this topic feel free to contact a moderater and get them to delete this post. Thanks and enjoy your wicked New Mclaren F1, it's a great car! Last edited by Gordo Bond 007; 06-30-2015, 11:52 AM. OMG! 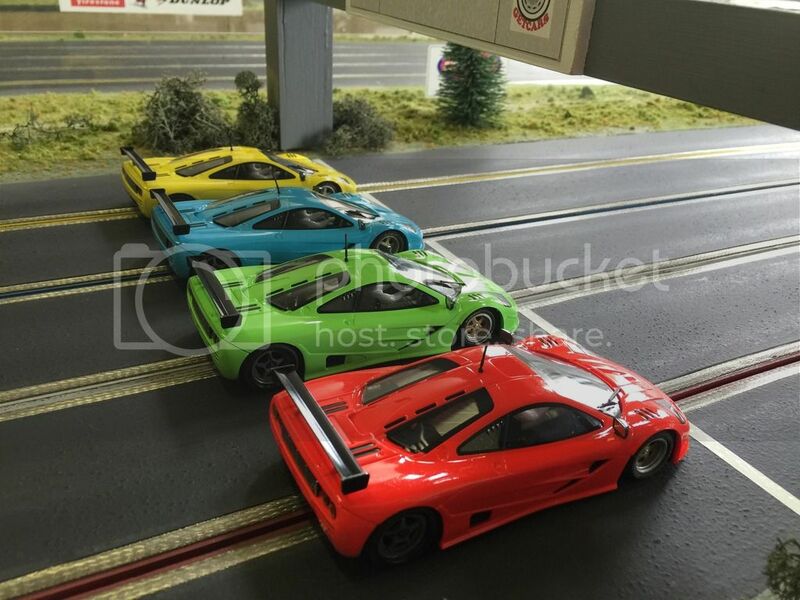 Another tunable slotcar that needs to be tuned to run properly? Why can't they make these things so they run perfectly? Exactly the way I want on my track? With exactly the right gearing & the exact same tires I like & why don't they preinstall the digital chip & why doesn't it have light &............etc. GMO! Last edited by monquispot; 06-30-2015, 12:17 PM. Good to hear from you Gordo, helpful fred, here. 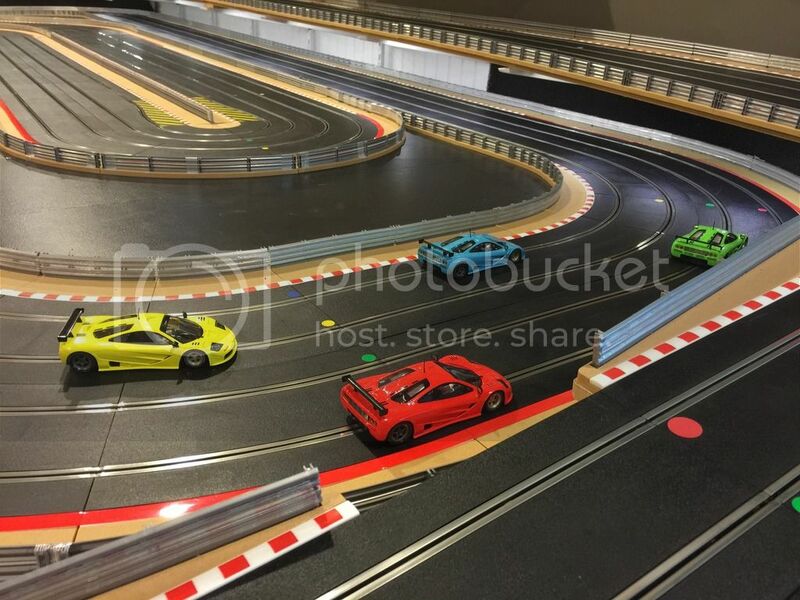 A serious piece of slot car! Fully adjustable front axle. And on top of that, the level of attention to detail here is most unusual: the holes in the chassis for the grub screws on the bottom of the axle have larger diameter holes for most of their depth: it is only the last section that is the appropriate diameter for the grub screw threads. Makes installing and adjusting much easier. Yes I know: this is a trivial detail. But it is a clear indication as to the thought that has gone into the design. The spur gear runs between the pod and the chassis. On the face of it this might seem irrelevant. BUT: it actually has huge value! This means the spur gear can be mounted closer to the center of the chassis (narrower) while the outside section of the chassis runs underneath the "wasted" space of the spur hub! This means you can have a narrower overall width, allowing for wider wheels and tyres. Such a seemingly insignificant little detail but with such huge practical benefit! The gear mesh is fantastic! The motor is held in place with two screws. And not just any screws: they have used countersunk screws. Once again: such a small, small little detail but it speaks volumes for the amount of thought that has gone into the design. It means that here as well you have lots of clearance. I personally like the fact that the front body mounting post is ahead of the guide. This would not always be possible but it just feels more solid. The rest of the pod seems very similar to the one in the Mazda. The single pod mounting screws fore and aft with the "outrigger" screws makes tuning and adjustment an absolute breeze. I also like the "caps" on the outriggers: allows for soft material to be inserted to dampen movement if so desired. The guide mount is unusually thick (and as a consequence: STRONG). At first I thought that this may make it impossible to fit a Slot.it guide. However: I have checked and the good news is that it will fit. The BETTER news is that the stock guide looks to be completely on par with a Slot.it guide: I can see absolutely no reason to replace it. In similar vein: everything about the car looks and feels SOLID without weighing a ton. The body looks very, very nice. Good level of detail, well finished, good paint, light without being excessively flimsy. I am very much looking forward to the liveried versions of this car: if they are to the same level as the "Contender" cars they will be special. Prediction: I firmly believe a 7.2 second lap is on the cards. I am anticipating that this will end up in the top 4% of my cars in terms of lap times. OK, the car has not turned a wheel yet so a lot of the above is theoretical and speculation, but I must say I am mightily impressed right out the gate. 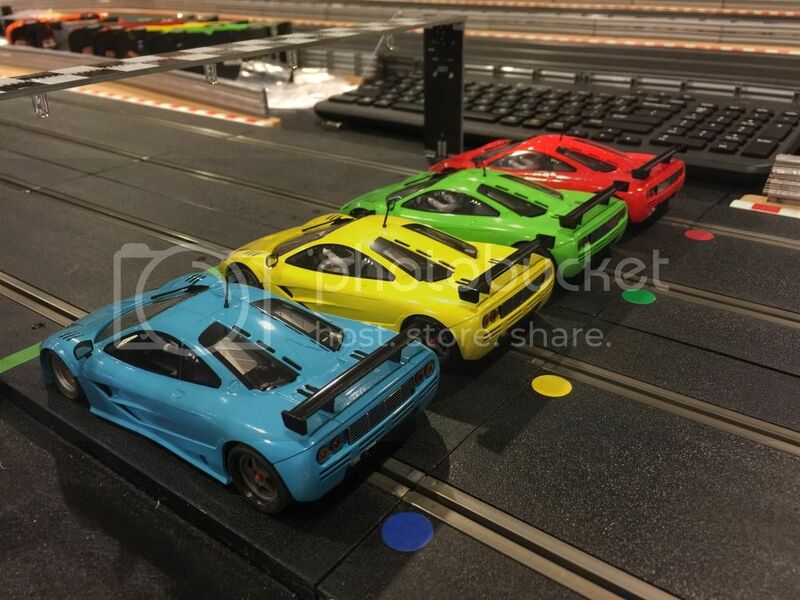 To me it certainly seems that MR Slotcar have upped the ante significantly in the value for money stakes. I apologize for the hassle with the front tires - It was a design oversight on my part and has caused a bit of grief for some racers. A smaller tire/wheel combination had been a consideration, but only after we had the moulds for the tires and inserts produced. Further delays in production and added costs in making new moulds was the reason we moved forward with the car as is. Most people I've spoken with have used a smaller front tire, like a Slot It Zero grip along with adding 4 set screws to help locate the front axle height. 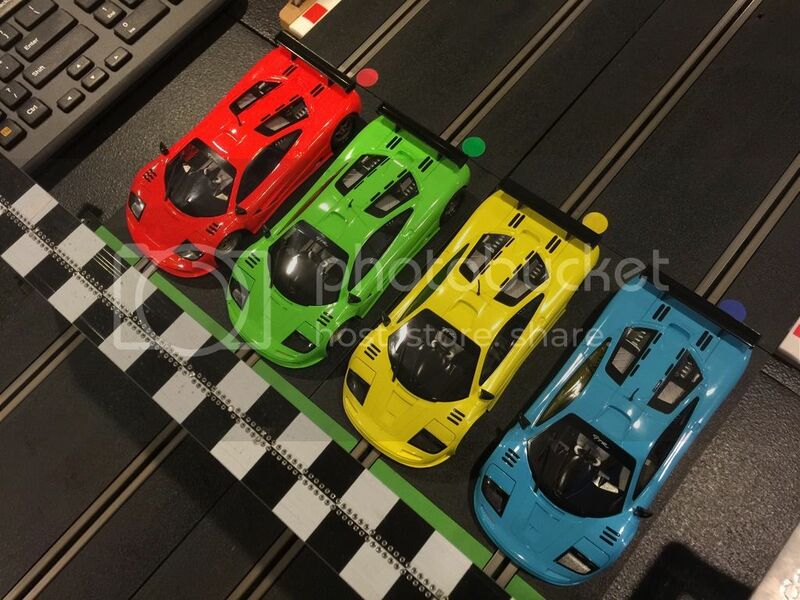 Last edited by mrslotcar.ca; 06-30-2015, 08:59 PM. Well my stunning blue example arrived yesterday and it really is beautiful! Now, I haven't had chance to get it on track yet, yes, my front tyres rub on the body work too, but the ride height is a little high so combined there is a slight problem. There again, one of the first things that I would do is to fit Slot.it zero grip ultra low profile tyres on the front and some sticky low profile rears too. Nothing special that you wouldn't normally do before racing so not exactly a deal breaker but a little frustrating with a car of this quality. Now for the bad news..... The anglewinder gear on mine does not run true. When you turn the rear axle by hand, there is a quite severe tight spot. On further inspection, the gear rubs against the pod for about 50% of it's diameter as it has a "buckle" in it. I have an MR alloy gear to fit but the stock gear should be perfect. Still, that has not diminished my enthusiasm for this quite lovely car. Now let me get it on the track! Last edited by longdog; 07-01-2015, 12:52 AM. 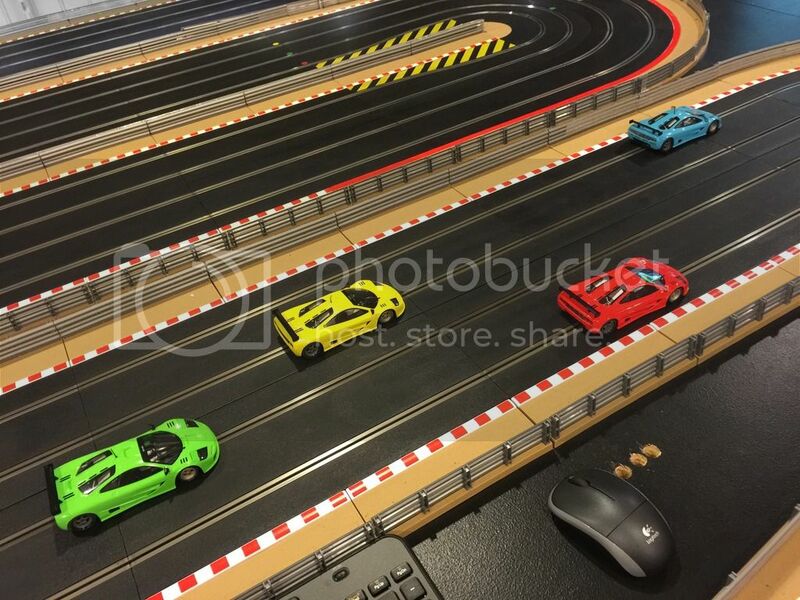 The cars look and run great! The cars are very smooth and corner very well, with no weight, just backoff the pod screws a 1/4 turn, and putting on urethanes. The cars are about .70 seconds faster than the Mazdas on my track. Mazdas ran 8.7 seconds and the McLaren runs 8.0 seconds. My track is a 4 lane 108 foot scaley track. I put on some smaller wheels for the front from spares from the MSC Mazda that I had lying around and put rubber on and trued them on the Hudy so that the axle sits as high as possible, with two set screws from the bottom at the two outer holes. This puts the guide and braid down to about flush with the bottom of the rubber of front wheels on the tech block, on tracks with recessed braiding you might choose to put a guide spacer to lower the guide. 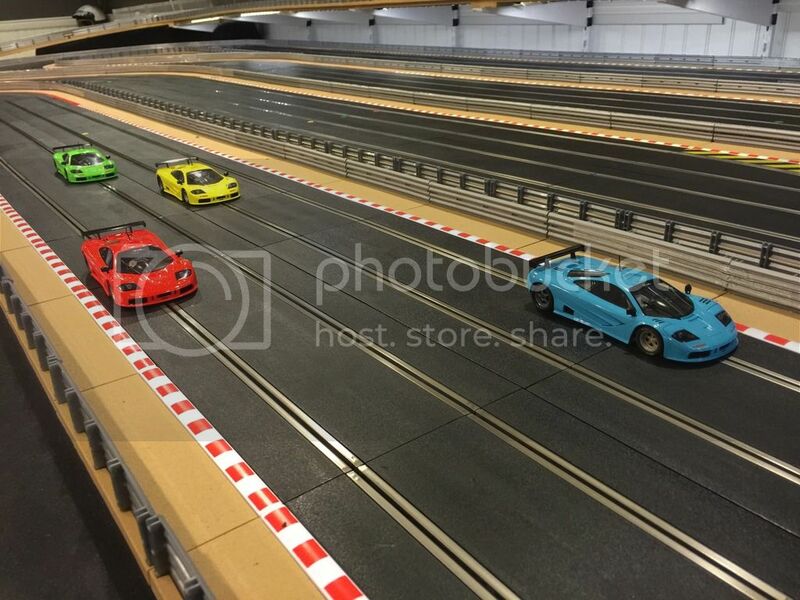 You can see the smaller wheel on the front of each car in the first picture. I did also put a washer under the front mounting post of body to give some clearance to the sides of body near the back of the front wheel well. So far I have ran them on my home track and the club Routed 4 Lane track and I am very happy! Last edited by heli_ca; 07-01-2015, 02:40 AM. I've had the pleasure of seeing all available colors as I sell those cars. They're very nice and bright colors. I particularly like the red. Like Alwyn said, attention to details is fantastic, on the mechanical side of things as well as for the body. Very well made, all-around. With minimal tuning, this car is one of the fastest on my track already. The front wheels have not been a problem for me as I always adjust the front axle height before putting the car on track. I added some oval point set screws right away, did a little truing on the front tires and I never noticed the rubbing once I put the car on track. On the other cars I have, I can see what you're talking about. But it's an easy fix. I also like the body screw in front of the guide. I would have preferred only one body screw at the back for easier float but I can see why it's better with two, the way the motor pod is made. The body feels robust, the chassis is also easy to manipulate and doesn't seem fragile. The build quality is definitely higher than average. Great job Ernie! The motor is fast and has a good power curve. I'm not a fan of the anglewinder configuration but I'll probably keep it just to keep this motor in the car. I will also try an inline configuration to see if I can get the car to be even faster (I like inline cars). 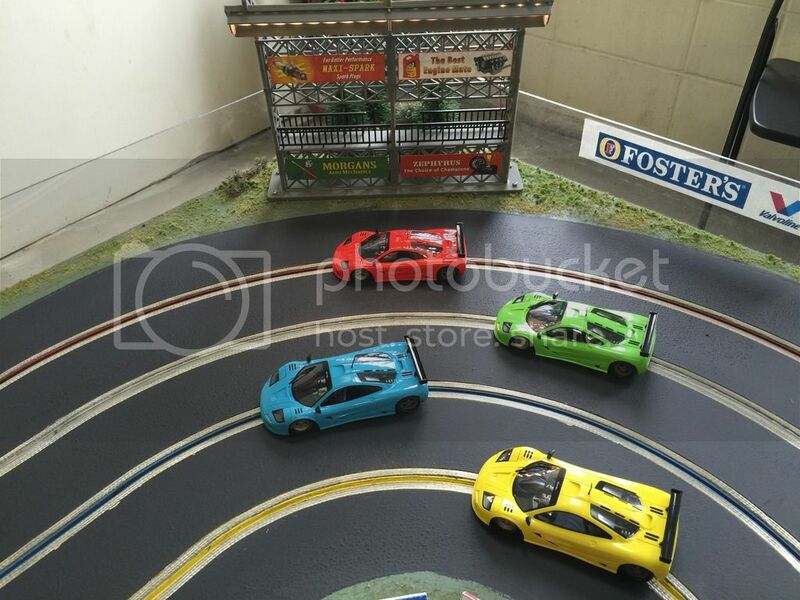 All in all, this car is without a doubt a fierce competitor to the best slot cars out there. It will be able to stand proud against the fastest and the next few months will confirm that. I've already decided that this car will be the official car of the 2nd annual Slot Car Corner Canada Proxy in 2016. Start tuning! 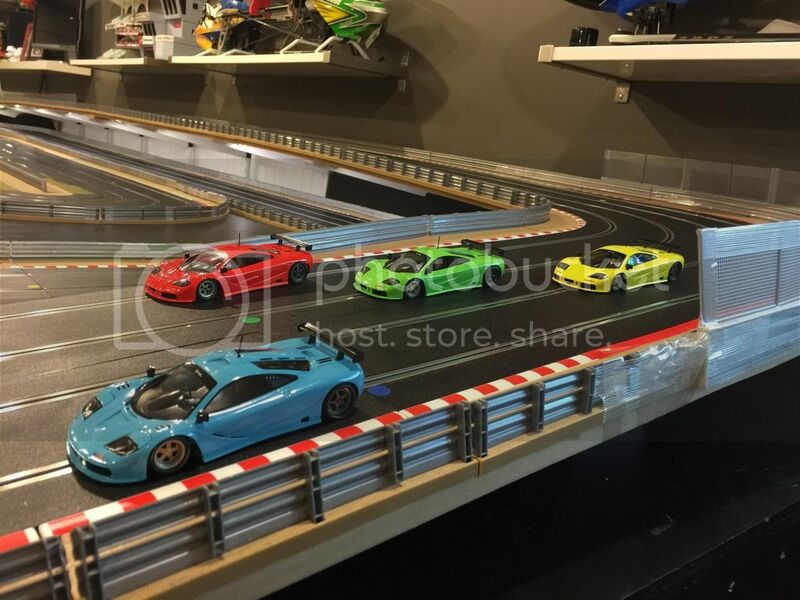 Heli_ca - great looking cars, beautiful tracks, everything looks super neat and tidy.....but even as a slot car guy, on a slot car forum I cannot help but stare at those STUNNING helicopters on the back wall! 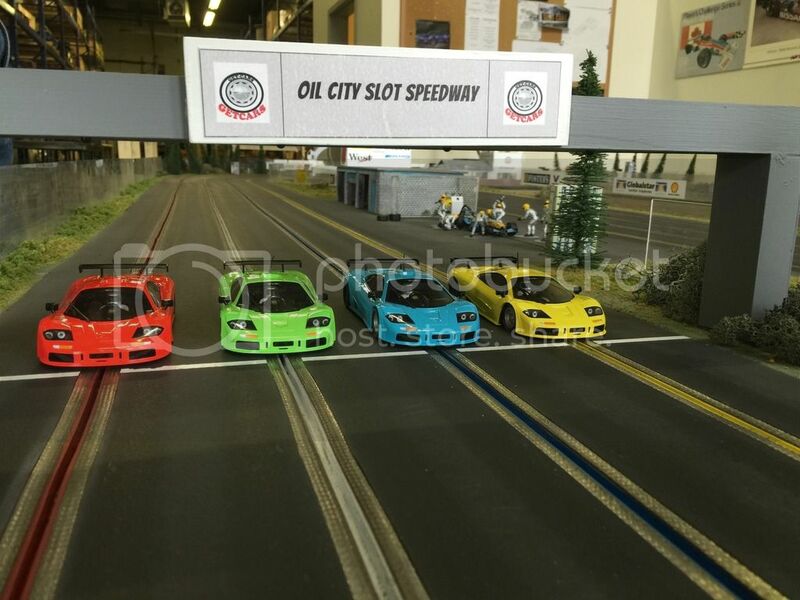 I might have a chance to win a MR Slotcar in the Canadian proxy, and since you almost have them all, what colour would you recommend? 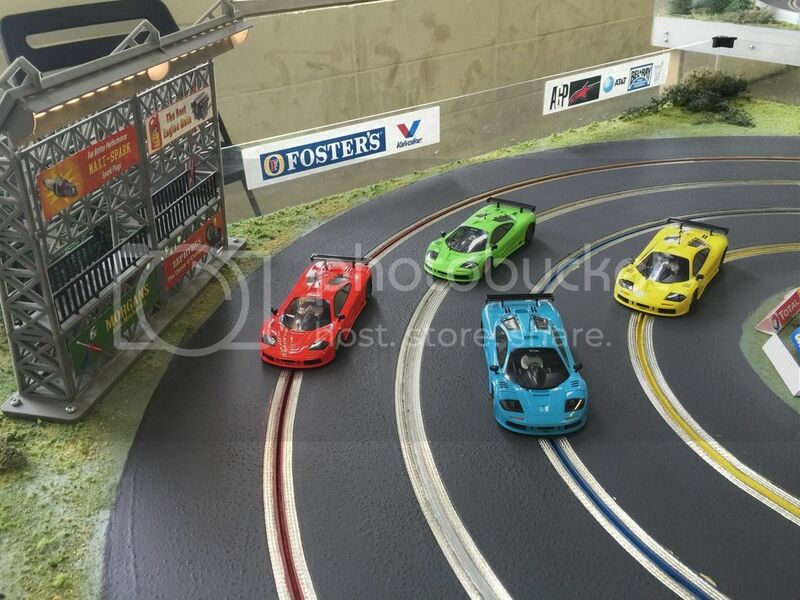 Is there a colour that you can just add decals and not have to repaint, like make the red a Marlboro car, or perhaps there are other options? Any suggestions? You think you'll have the choice of colors??!! I say: "never count your chickens before they hatch..." or, "it's not over until the fat lady sing, and I don't hear no singing"
Is the purple car a deep rich royal color, or is it a lavendar, paler purple? Have seen images online that are inconclusive. Those Helis in the wall are just shelf queens. 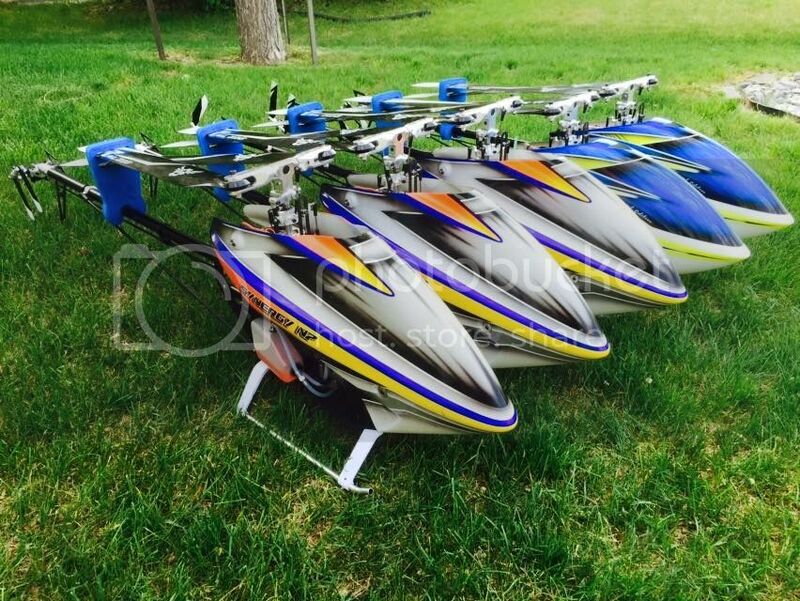 These are the current Helis! f1fan you have a chance to win a McLaren like McDavid had a chance to be picked first overall! The red is stunning by the way, yellow and green are good too. 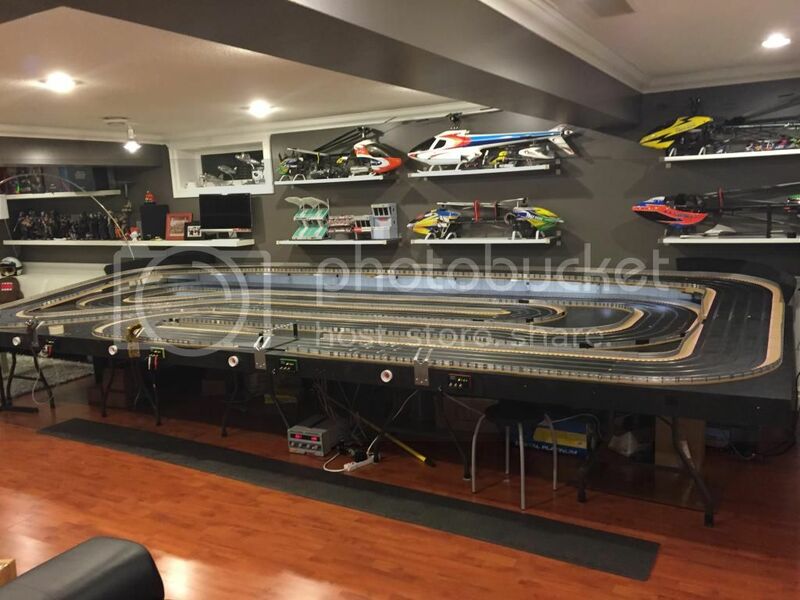 Hey f1fan I'll trade you a Heli for you to teach me how to build and tune slot cars! Last edited by heli_ca; 07-01-2015, 09:41 AM. Color perception is VERY subjective. But to me, the purple car is more rich than it is lavender. It's not quite deep rich royal but closer to that than the paler purple you're talking about. It's a real, rich purple. I have the blue car but IMHO, it was a tough choice between the green, purple, red and blue. Stunning cars with the caveat that I have already mentioned earlier in the thread.